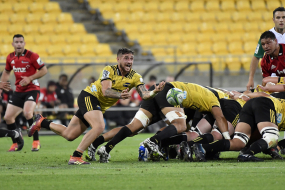 After 24 minutes in the first half of the Super Rugby match between the Hurricanes and the Crusaders, Bryn Hall, the Crusaders' scrumhalf, puts the ball into a scrum. In the wheeling of the scrum, Matt Todd, the Crusaders' left flank, had wheeled with the scrum and was behind Perenara when Perenara took the tap kick. As Perenara takes the kick, Todd accelerated towards Perenara and seemed to make contact with Perenara. Perenara spilled the ball. The referee immediately penalised Todd and showed him a yellow card. Perenara was entitled to run, unimpeded, for 10 metres. Todd's action seemed top prevent Perenara from doing that. The referee obviously decided that Todd had acted deliberately to prevent Perenara's taking a quick tap kick. This way of acting is sometimes referred to by referees as cynical, acting purely out of self-interest without regard to the provisions of the game and the sportsmanship it hopes to achieve. It was more than just an infringement. It was an infringement with intent. The referee had three choices in dealing with Todd - a penalty, a penalty and a yellow card, a penalty and a red card.